In this article, I want to offer an in-depth guide for both advanced musicians and beginners on how to use samples to compose and produce music. Today, we'll look at how to use a sampler and how to Drag and Drop (linear sequence) samples. The benefits of using samples for music creation are numerous but this article does not encourage producers to embrace sample libraries as the only creation tool at their disposal. 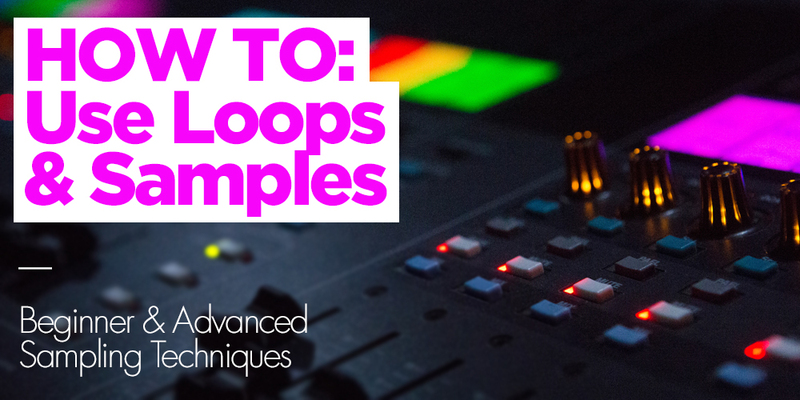 Instead, this guide will help you master just one of the major assets available for modern music production, how to use samples. Sampling should be used to complement the two other fundamental techniques for audio creation - live recording and MIDI sequencing. Make sure to watch the accompanying tutorial video to ensure you get the most from this guide to using sample packs. One of the major problems when working with audio samples instead of MIDI is that the key and tempo of each sample is fixed. You'll have to do some adjustment if you want to adapt the samples to fit projects with different key and tempo settings. Fortunately, most modern tools designed to work with loops and samples come with different algorithms to adjust both the pitch and the tempo. The most popular and straightforward approach to working with audio samples is to drag and drop them onto the audio tracks of a DAW. This method offers a very quick way of starting to combine and sequence audio loops, as it takes nothing more than a digital audio workstation (DAW) and a sample pack to put it into practice. In this tutorial, I’ll be using Ableton Live and a sample pack called Dark Melodic Techno Vol 1 by the Producer Loops label. These techniques work on any kind of sample but click the link to browse their entire range of Techno sample packs. Before loading any samples onto the DAW, we need to make sure that the BPM of our project matches that of the loops we’re going to work with so as to avoid any unnecessary time stretching. It’s also useful to activate the Arrangement View to start working on a smaller area of the sequencer. Once the sample is loaded onto an audio track, the first thing you may want to do is adjust its length by dragging its right edge horizontally, as well as setting the start point by dragging the offset handler horizontally or shifting the audio content by scrubbing over the clip while holding Ctrl/Shift or Command/Shift. Once that’s done, there are a few basic settings that we can start tweaking. We can adjust the pitch by semitones and the amplitude by db's. There are also some important buttons such as Loop, which allows the sample to play in loop mode, Reverse to make it play backwards, and Warp to sync the loop to the project tempo. There are also a couple of functions to control the timing of the loops. One of these functions is the Warp Engine, which, apart from being used to synchronize our loops to the host tempo, can be used to create variations in timing, by either doubling or halving the bpm of the loop with the :2 and *2 buttons located below the Segment BPM value, or by creating and dragging warp markers horizontally on top of the sample editor. The other function that we can use to make changes in the timing of the loops is the clip groove, which uses MIDI files as models to modify the positioning and velocity of the audio events in the sample. Apart from these basic settings, there’s also a set of envelopes that allow us to program changes on some parameters with automation curves. These envelopes are Volume Modulation, which allows us to automate volume, Transposition Modulation for pitch, Grain Size Modulation for the resolution of the granular structure of the sample, Flux Modulation for adding randomness to the playback order of the audio grains, and Sample Offset Modulation, to control the start point of the sample. Be aware that these envelopes work differently depending on the warp mode that you set from the warp modes list. For example, Grain Size Modulation only works on the Tones and Textures modes, Flux only works on Textures mode and Sample Offset only works on Beats mode. Also, keep in mind that Grain Size and Flux only become noticeable on areas where the pitch or the timing of the sample have been modified, and that the rest of the envelopes may also yield different results depending on the warp mode that is selected. Once we are familiar with the addition of individual samples we can start combining them in multiple audio tracks to create arrangements. We can combine the samples by dragging new samples into the arrangement or by duplicating the ones that are already present in the timeline with Ctrl/D, alternatively, we can stretch the right edge handler of a sample with the Loop mode active to make it loop for as long as we like. This leads to other important functions such as Volume Crossfading between adjacent samples, which allows us to blend samples in a transitional way, as well as Clip Deactivation, which makes it possible to mute sections of a sample by simply selecting them and tapping the shortcut 0. This allows us to create arrangements between several stacked loops very easily. Now you know how to use samples via the Drag and Drop method, it' time to check out how to use a sampler. An alternative approach to using audio tracks to compose sample-based parts is the use of samplers. With this method, we can take advantage of many benefits and features unique to sampling, such as real-time sample triggering and positioning, as well as volume and length control via MIDI. With this approach, we can play audio loops and sounds more like an instrument, as opposed to the traditional linear sequencing of audio samples. To load a sample into Live’s Simpler we can drag and drop it into Simpler from the browser content pane. After being loaded, the sample can be swapped with any other sample from the browser with the Hot Swap button. The first thing we should do when working with loops is to activate Warp Mode so that the loop stays in sync with the host. The pitch can be set with the Transpose setting of the Pitch Envelope Control within the Controls top tab. sequenced beforehand, and when we are happy with the preview, we just hit the record button and record the notes. In order to sequence the samples with MIDI notes, we need to handle their quantization. This can be done as we record, by adjusting the Record Quantization value in the edit menu, or after being recorded by adjusting the Quantize Settings in the edit menu and tapping Quantize or Ctrl/U. One other thing that sets samplers apart when it comes to working with samples is the addition of sound sculpting tools such as filters. Filters allow us to shape the tone of the samples in real time, very much like a synthesizer but without having to insert any additional effects. Another interesting source of experimentation with samplers is the Loop function, which can be activated with the Loop switch. This allows us to play samples indefinitely for as long as we keep the MIDI note pressed, and then adjust, or even automate, the start and end points of the loop for real-time rhythmical variations with the Start and Length parameters. Another important setting that allows us to control the sample length with MIDI notes is the Amplitude Envelope, which by default is set so that the loop stops playing when the midi note is released. In case we want the loop to have a fade out instead of an immediate stop, we can increase the Release value of the Amplitude Envelope to our taste. Now you know how to use samples most effectively in your music productions! With the staggering amount of top quality sample packs that are released on a daily basis by platforms such as Producer Loops, audio samples have become an inexhaustible source of instantaneous creativity for music production and sound design. Samples can take your work to unimagined highs - if used correctly. The key takeaway here is to understand the weaknesses and strengths of audio sampling and get its two main methods of manipulation down to a science. You'll then know what to look for, how to organize the sample material and what approach to use at any given time to achieve the desired results. 10 tips and tricks to help you start a bestselling sample label or to improve your existing label's sales. We'll teach you how to sequence, automate, trigger MIDI loops. You'll also learn how to use Ableton Live's MIDI effects. © 2008-2019 Producer Loops Ltd. All rights reserved. Your track has been added to the playlist.